On June 27, 1969, a police raid on the Stonewall Inn, a New York City gay bar, took a surprising turn when patrons decided it was time to fight back. As a riot erupted in Greenwich Village, a new era in the gay rights movement was born. Among the crowd that day was 23-year-old film student Vito Russo. In the aftermath of the infamous rebellion, a raid on an after-hours bar he frequented ended with a young gay man impaling himself on a fence while trying to escape the police. This is when Vito found his voice as a gay activist and critic of homosexual representation in the media. Over the next 20 years, until his death from AIDS in 1990, Vito Russo was one of the most outspoken and inspiring activists in the LGBT community's fight for equal rights. 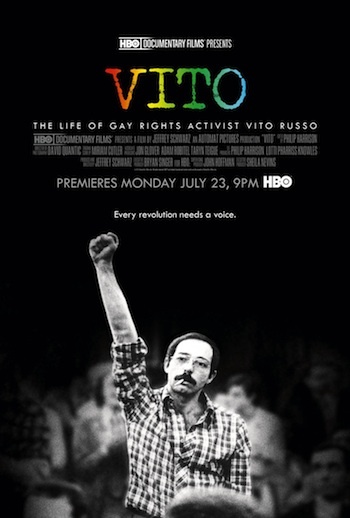 Recounting the life of one of the founding fathers of the gay liberation movement, the inspiring documentary VITO debuts MONDAY, JULY 23 (9:00-10:45 p.m. ET/PT), exclusively on HBO.